Chicago aims to be the most electrified city in the U.S.
As we enter the new era of electric vehicles, cities around the world are preparing their infrastructure for the many electric vehicles to come to market in the next five years. Our hometown Chicago has big ambitions on becoming one of the biggest “electrified cities in the US”. The city of Chicago and Illinois Gov. Pat Quinn today announced last month that Chicago aims to offer 280 charging stations in the city and surrounding region by the end of 2011. To deal with the issue of recharging wait times, the $8.9 million Electric Vehicle Infrastructure Project will allocate a substantial amount towards DC quick-chargers, the type that can recharge a compatible electric car to 80% within 30 minutes. As expected, the “competition” comes from Los Angeles, the only city in the US to offer slightly more quick-chargers. San Diego-based 350Green LLC, the contractor that will install and manage the charging stations, said there will be 73 quick-charging stations and 207 Level 2 chargers. The 240-volt Level 2 type can add roughly 10 miles of range per hour to vehicles like the Chevrolet Volt, Nissan Leaf and Mitsubishi i-MiEV. The upcoming 2012 Ford Focus Electric is capable of adding 20 miles of range per hour at Level 2 but will not be equipped with a quick-charge port. Currently, quick-charge capability is limited to the Leaf and i-MiEV. The MINI e uses a lithium-ion 35kWh battery that needs approximately 3 hrs to charge from a 240 V, 48 Amps outlet, or 4.5 hrs from 240 V 32 Amps outlet or 26.5 hours if you’re using the regular 110V outlets. The company will also install 72 CharJit Express Plazas that include one quick-charger and two Level 2 hookups. The remaining 61 Level 2 stations will be for the exclusive use of car-sharing services I-Go and Zipcar. For Cars.com, Suzanne Malec-McKenna, commissioner of the city’s Department of Environment said roughly 50 quick-chargers and 170 Level 2 stations will be in the city proper, and the distribution extends more than 40 miles from the city center, encompassing 23 suburbs and multiple counties. Though all locations aren’t finalized, they will include retail shopping centers, O’Hare and Midway airports and parking lots, as well as tollway oases. A map at the 2011 Chicago Auto Show announcement showed installations on Interstates 80, 90, 94 and 294. Since reselling electricity is prohibited by law, owners of electric vehicles will pay per session or through a monthly subscription. Malec-McKenna hopes that by setting in place a strong electric infrastructure manufacturers will be encouraged to sell more electric vehicles in Chicago. MINI E Fleet trials began in 2009 in the USA and it’s available only for customers in New York, Los Angeles and in the state of New Jersey. 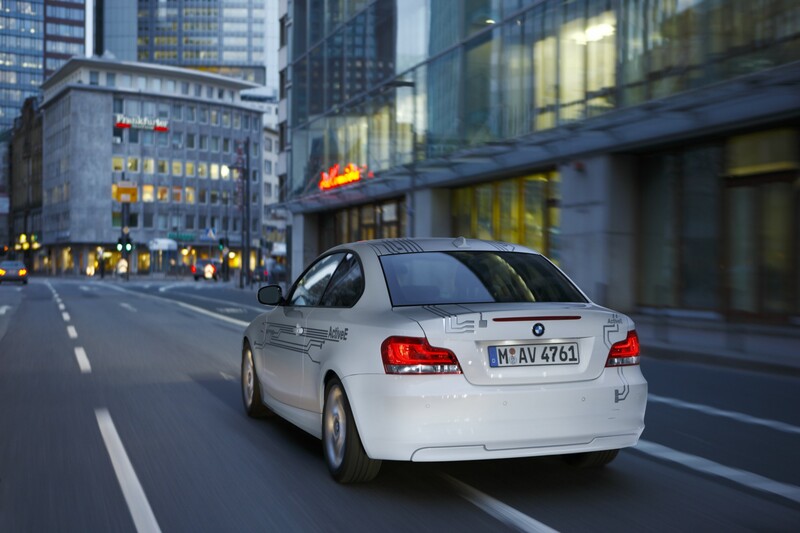 This summer, BMW launches the ActiveE, an electric vehicle based on the 1 Series Coupe platform. The field trial will again incude the New York Metro and Greater Los Angeles and will be joined by Metropolitan markets of San Diego, San Francisco, Sacramento and Boston. MINI offered its customers a free installation of a home charging unit. The Volt charger from GM costs $495, and about $1,500 to install, although it could be more depending on how much work is needed at the house. In the next few years, premium automakers, BMW included, will be launching a new series of electric vehicles built from ground up. While the MINI E and ActiveE are considered electric vehicles conversions, the upcoming i3 is the first vehicle to emerge from under the BMW i sub-brand and will represent a new milestone for BMW in the premium mobility segment. Cities’ infrastructure has always been a concern for automakers, but recent initiatives are encouraging and electric vehicles will live past the initial hype.